Astound them with all the beauty around the Puget Sound! Includes the Guide Book to Seattle so they can learn about all the fun and interesting things to do around the Seattle area including sightseeing, recreation, dining, nightlife and shopping. Partnered with Portlock's Smoked Salmon, Partners Walla Walla Onion Crackers, Dilettante Seattle Truffles, Chukar Chocolate Cherries, Snoqualmie Candy Co. Caramel Corn, Seattle’s Best Coffee and Seattle’s Own Shortbread. 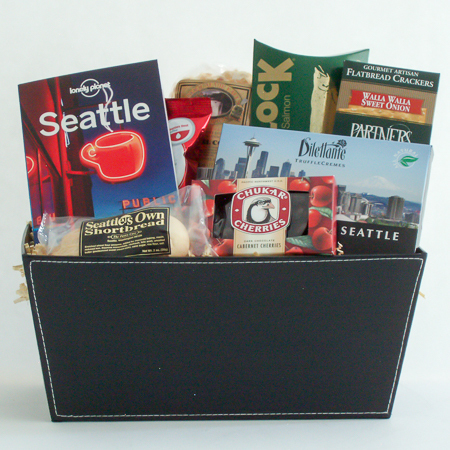 A great Seattle relocation gift basket or realtor closing gift to welcome newcomers to Seattle!